Keeping this blog has introduced us to a lot of great people online, and every so often our online and offline social lives meet. Walking through the Quartzsite RV show the other day, we bumped into Rick and Joanne who blog at Rick and Joanne’s RV Travels. A little later, a couple stopped us on the street because they recognized our faces from our pics. They turned out to be Linda and Bruce who blog at The Phase Place and write for Bus Conversion Magazine. What fun! This online/offline way of connecting is dramatically changing the experience of traveling full-time, as it is opening our lives to people with similar interests that we would never get to know otherwise. Yesterday our online and offline worlds came together once again when we hooked up with fellow RV bloggers Chris and Cherie who write the blog Technomadia. They are unusual full-time RVers because they are in their forties, which is younger than most full-timers we meet on the road. They also work full-time and have a wide variety of terrific projects. This past year they wrote The Mobile Internet Handbook sharing a multitude of secrets about how to get good internet and phone access on the road. 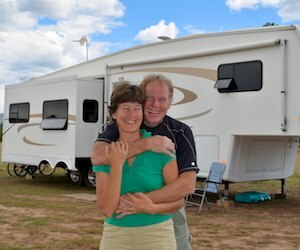 They also spearheaded the beta testing and roll-out of the enormously successful social media and social connection website for RVers, RVillage.com, and they have continued to write their immensely informative blog about the technology aspects of the full-time RV lifestyle. Despite living in a cool vintage 1961 bus conversion (their bus retired from being a bus in the Nogales AZ area back in 1988), they are decidedly high tech. In contrast, we live in a newer fifth wheel , but we are decidedly low tech! That’s the beauty of this lifestyle — you can do it any way that works for you. So, when we discovered (online) that they were parked less than a mile from our buggy (offline), this seemed like a great chance to meet face to face rather than screen to screen. Finding someone out here, where thousands of rigs are scattered to the four winds across the desert floor, is not the easiest task! After an amusing email exchange that was littered with funny reality checks because we don’t have a phone or a GPS, and Google Maps satellite photos show only scrub brush for miles around, they gave us old fashioned directions and we took a pleasant walk in the morning sun right to their front door. It was really fun to discover that even though we have taken different approaches to living this lifestyle, we have a lot in common. We both started this crazy lifestyle about the same time, when RV blogs were very hard to find, and we both turned to Miss Tioga and George to get pointers for how to live in an RV full-time (and to get ideas for what we might put in our own websites once we got out there too!). We also both cast off the shackles of conventional living to move into small “starter” trailers (they started in a teardrop!) long before we reached retirement age. 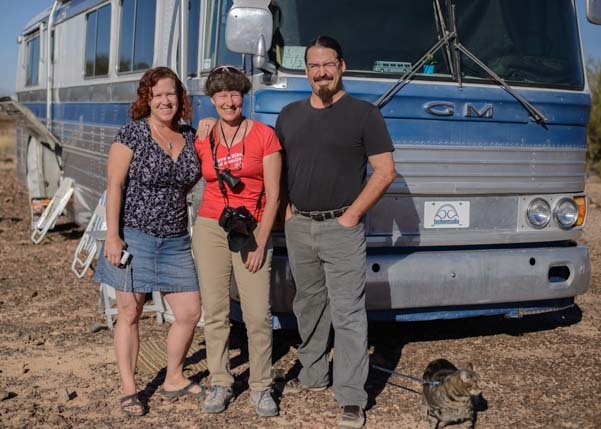 They are now very involved in helping younger full-time RVers find each other and come together using online connections like the Facebook group NuRVers as well as RVillage. This is a fabulous boon, not only to younger RVers getting started today, but to to the whole RVing community. Hats off to them and to all the younger full-timers on the road today who are living their dreams and sharing their experiences online, including Watsons Wander, WheelingIt, and Interstellar Orchard to name just a few. Always great fun to meet like-minded folks. I am guessing you are meeting a bunch at the Q. We are, LuAnn. And you’ve been at one of the most wonderful RV parks in existence — Jojoba Hills. What fun!